Pyrotechnic devices should be stored in a cool, dry location and must be readily accessible in case of an emergency. Care should be taken to prevent puncturing or otherwise damaging their coverings. 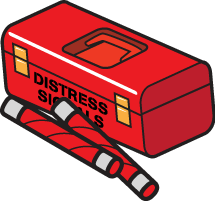 A watertight container, such as a surplus ammunition box, painted red or orange and prominently marked "DISTRESS SIGNALS" is recommended. If young children are frequently aboard your boat, careful selection and proper storage of visual distress signals is important. Coast Guard-approved pyrotechnic devices carry an expiration date. After this date, the device can no longer be counted toward the minimum requirements.